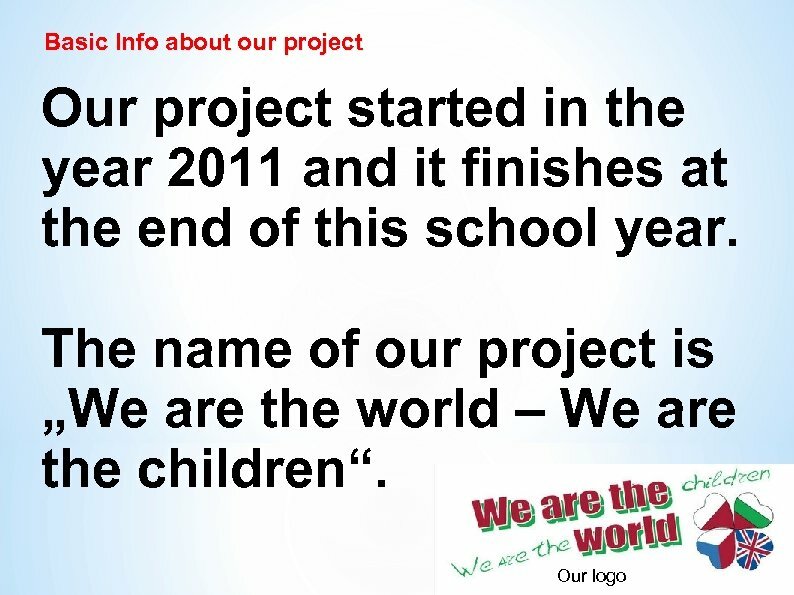 Aims of our project * to find out something about other countries and their traditions, culture, history and family life. 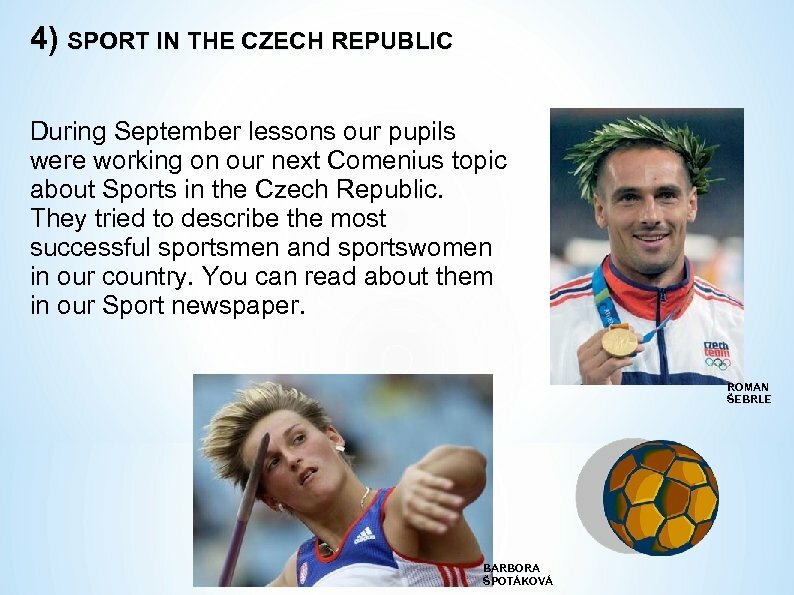 * to get know to our partners about sport and music in our country, about Czech important personalities, the system of the Czech education and ways we spend our free time. * to make eight pieces of newspaper about the results of our project. * to meet new friends. * to improve our English. Meetings in partner countries • We met our friends in the Czech Republic, Great Britain , Bulgaria and Poland. • We have great memories and lots of photos and experience. 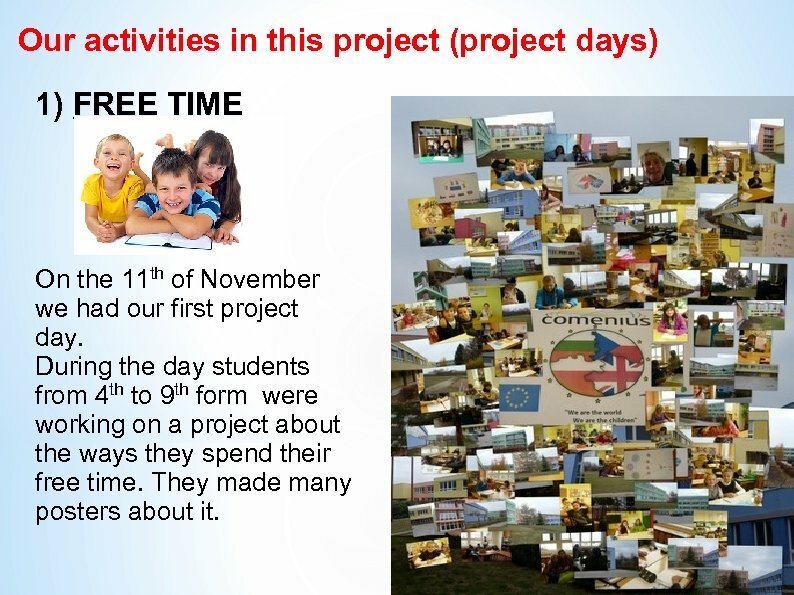 Our activities in this project (project days) 1) FREE TIME On the 11 th of November we had our first project day. During the day students from 4 th to 9 th form were working on a project about the ways they spend their free time. They made many posters about it. 2) MEETING IN THE CZECH REPUBLIC At the beginning of October 2011 15 students and 8 teachers from our partner schools in Great Britain, Poland Bulgaria visited our primary school in Brno. On Monday we went on a trip to our capital city of Prague, where we visited important places and could see many beautiful old buildings. Next afternoon we spent in caves of „Moravský kras“ and in Brno. We also had an official meeting in our school, where we prepared many activities and workshops for our partners. 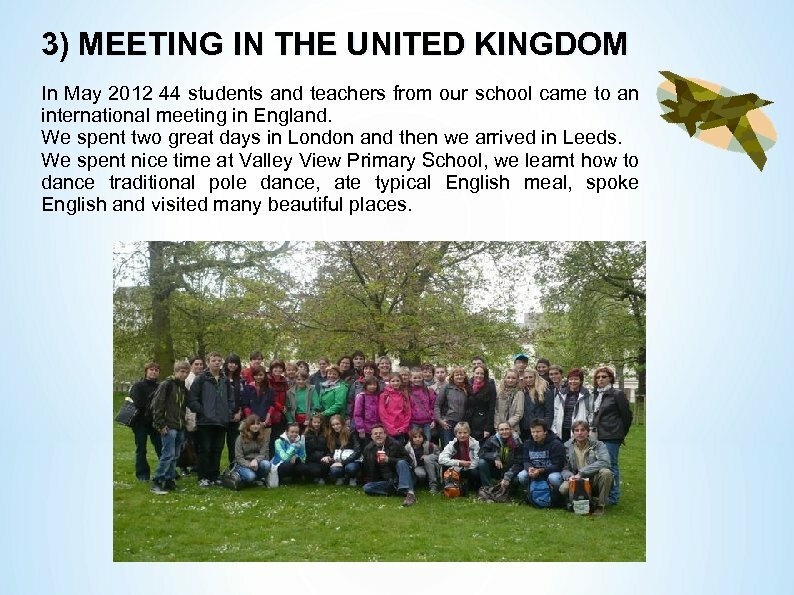 3) MEETING IN THE UNITED KINGDOM In May 2012 44 students and teachers from our school came to an international meeting in England. We spent two great days in London and then we arrived in Leeds. We spent nice time at Valley View Primary School, we learnt how to dance traditional pole dance, ate typical English meal, spoke English and visited many beautiful places. 5) EDUCATION IN EUROPE At the end of September all our pupils worked on the project about education in Europe. Younger pupils made posters and played small theatres about history of the Czech education, older students made posters, comics and projects about the system of education in the UK, Poland Bulgaria. You can find out some important information from our video, that was made by pupils aged 12. 6) MEETING IN POLAND In October 2012 there was our third meeting in Poland. We visited Warsaw, Krakow and our partner school in Dobranowice. Our friends prepared very nice sport and culture programme for us, we danced, sang, painted and could speak English again. 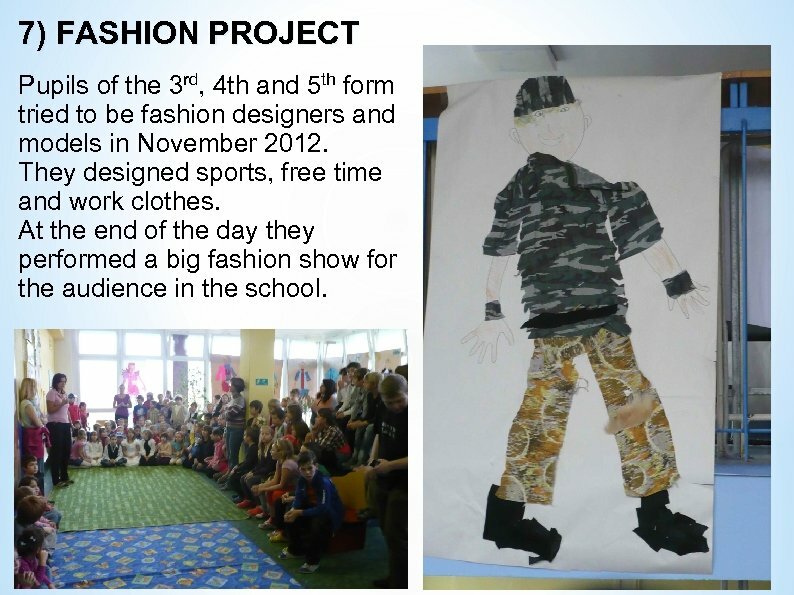 7) FASHION PROJECT Pupils of the 3 rd, 4 th and 5 th form tried to be fashion designers and models in November 2012. They designed sports, free time and work clothes. At the end of the day they performed a big fashion show for the audience in the school. 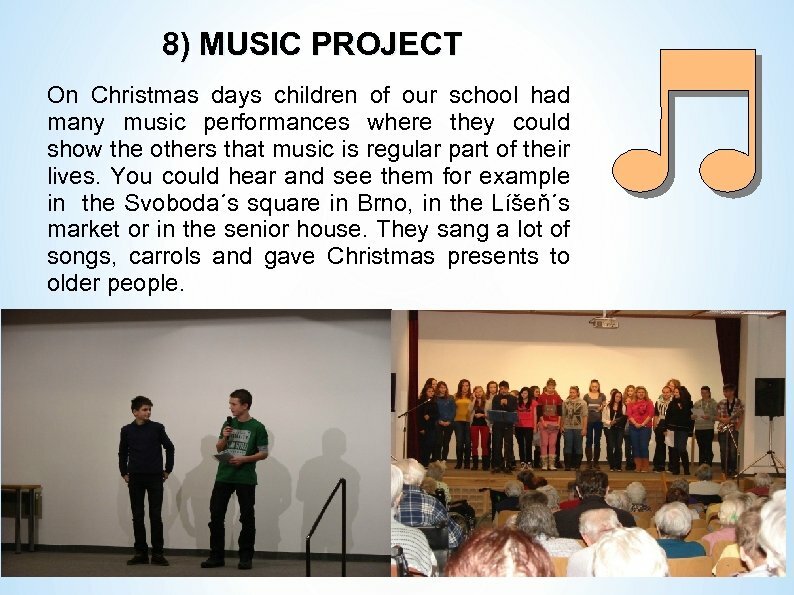 8) MUSIC PROJECT On Christmas days children of our school had many music performances where they could show the others that music is regular part of their lives. You could hear and see them for example in the Svoboda´s square in Brno, in the Líšeň´s market or in the senior house. They sang a lot of songs, carrols and gave Christmas presents to older people. 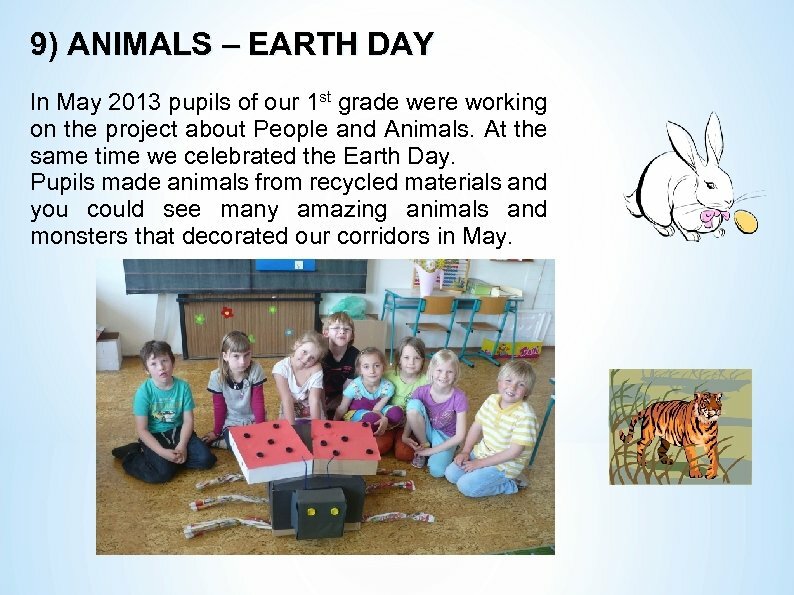 9) ANIMALS – EARTH DAY In May 2013 pupils of our 1 st grade were working on the project about People and Animals. At the same time we celebrated the Earth Day. Pupils made animals from recycled materials and you could see many amazing animals and monsters that decorated our corridors in May. 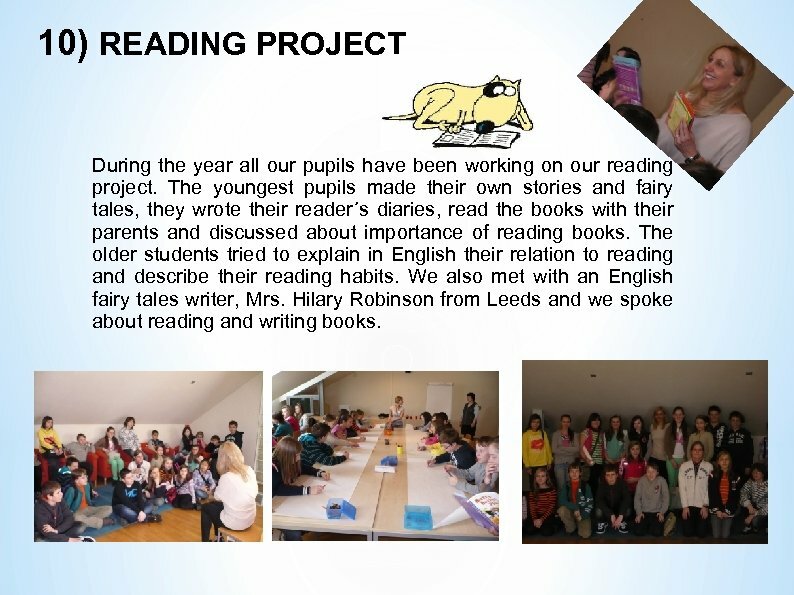 10) READING PROJECT During the year all our pupils have been working on our reading project. The youngest pupils made their own stories and fairy tales, they wrote their reader´s diaries, read the books with their parents and discussed about importance of reading books. The older students tried to explain in English their relation to reading and describe their reading habits. We also met with an English fairy tales writer, Mrs. Hilary Robinson from Leeds and we spoke about reading and writing books.